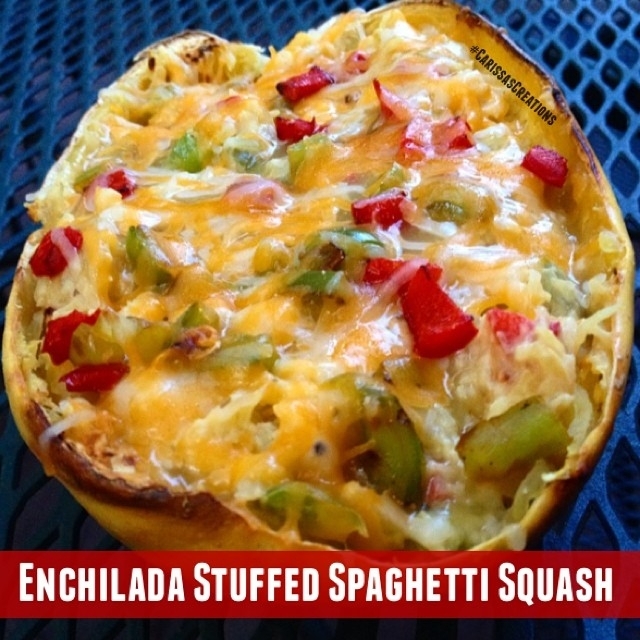 This filling and satisfying stuffed spaghetti squash tastes exactly like an enchilada without the extra calories! Preheat oven to 400 degrees. Cut spaghetti squash in half lengthwise. Scoop out seeds then season with salt and pepper. Place both halves face down on greased baking pan and bake for 50 minutes. Meanwhile, cook bell peppers on skillet for about 5 minutes. Remove squash from oven and scoop out spaghetti squash strands into medium sized bowl. Mix with cream cheese, chicken, half of the enchilada sauce, and bell peppers. Spoon mixture back into spaghetti squash "bowls". Top each bowl with remaining enchilada sauce and shredded cheese. Return to oven for 5 more minutes, or until cheese is melted.